Summertime in the suburbs of DC always swelters. Humidity. Tourists. So much gross. 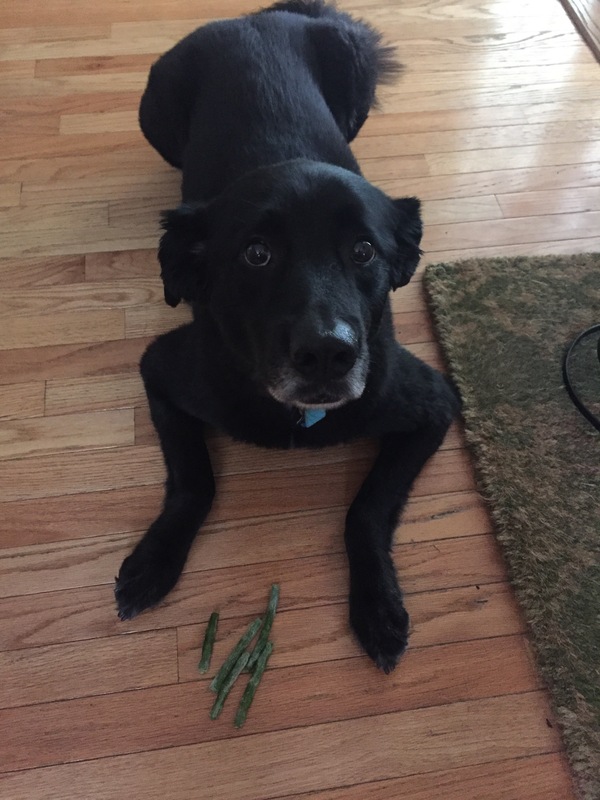 Frozen Nibbles: Zozo will do anything for frozen green beans and/or banana slices. We put them on top of his dried food or use them as treats after short trips outside. He’ll wait (im)patiently for them when we come inside. why must you torture me with “wait”? When he was younger, we could sate him with ice cubes. As he’s aged, he’s less interested in them. But frozen treats seem to do the trick. Basement dwelling: it’s like we have an adolescent human boy. He lurks in the dark corners of the basement, drawn out only by promises of food. It’s cool. It’s dark. Quiet. There’s video games and instruments. He loves it. And he’s reluctant to come up or share the couch. 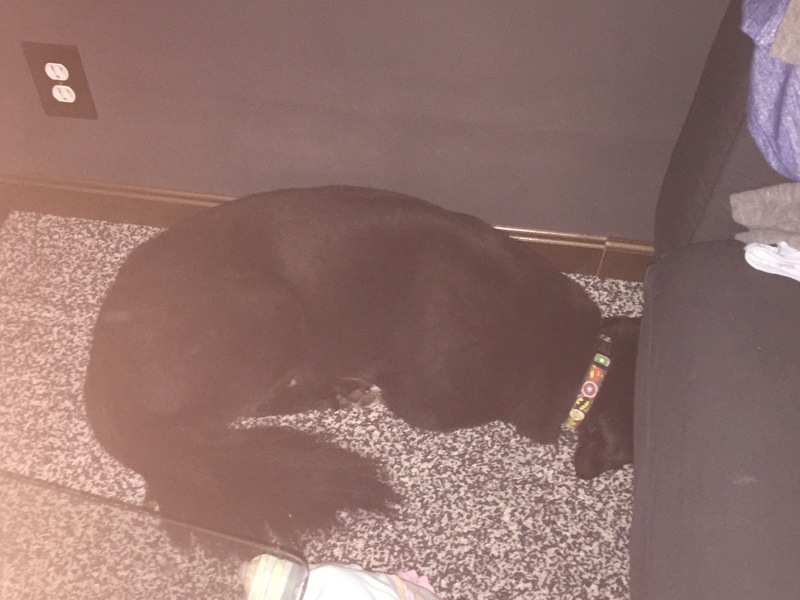 Or he’s under it. Close crops: like it or not, we cut off all of his fur for the summer. His shaggy, flat black coat is unbearable in the sunshine and heat. He’s groomed closed to his skin– so close that you can see how white his belly is. And it makes me laugh when he’s sleek and skin-y. Water sports: Zozo loves to swim. Loves it. He like to splash and paddle and chase balls. We don’t have a pool at our disposal, so we often take him to Old Towne Pet Resort for a dip and a bath. Tell us! How do you stay cool when it’s hot outside? What are some things we should try? I’m a planner. We’ve discussed this. I’m happiest when I get to organize, when there’s a to-do list, and when I can track my accomplishments. I get frustrated and disappointed when my hard work is undone by things that are outside of my control. But I’m also the person you want on your side in a crisis. Change is good. I’m flexible. Two opposite people living in my little virgo body. The struggle is real. We like to take trips with the dogs. The Outer Banks, Asheville, Woodstock (which I neglected to blog about but I’ll get back to)… this year is no different. For our very first “just us three” trip, Zo, James and I set our sights on Charlottesville, VA. We heard it was a great place to hang out: funky, historic, walkable, pet-friendly. I rented a house. I made reservations for dinners. We made “excursion” plans. And then we changed them on the fly. See, on our way to Charlottesville, we planned to take a slight detour along Skyline Drive and take Zo for a hike. Our travel plans coincided with the commencement of year-long activities celebrating the Centennial of the National Park Service. We were excited to hike newly refurbished, blazed trails; to shake off the city and work and stress and enjoy the fresh, clean air. In the days leading up to our trip, the news began reporting of a wildfire along Skyline. We tracked the fire and changed our route. Every day in the week leading up to the trip, we tracked and changed and tracked and changed. Thousands of acres of forest were destroyed. Skyline closed. Our big “WE’RE ON VACATION” moment came to a halt. So I stressed and planned. The morning of our departure, I nooked into the corner of the couch, laptop perched on my knees, looking for solid hikes do-able with a dog. I hounded James with links and maps and “what abouts.” He told me to calm down. I scowled a lot. Zozo slept. And then I found it: Humpback Rocks in Crozet, VA. 45 minutes from Charlottesville along the Blue Ridge Mountains. We packed the car, strapped the pup in, and hit the road. I felt better. And then the rain started. It rained fairly steadily the entire drive. When it wasn’t raining, it was misting. But I was going to hike, dammit. And so, we did. Ok, so here’s a preview of our Woodstock trip. This is the Mount Overlook trail. It was 3 miles up a sharp pitch. And it was that. And more… much more. Checking the map and trail warnings before we started out. There was a warning that the trail is slippery when wet. SO WHAT, I SAY! Like clockwork, Zozo took a pit stop 1/4 of a mile from a trash can. Instead of carrying it the rest of the way, James humped back down to the trailhead to dispose of the bag. He’s a hero. Just a dog and his boy. Ahead, there be boulders. The trail became all scramble. I figured you might not believe me. See. Boulder. Oh, and it’s raining again. I might have said something stupid like, “that wasn’t so terrible, and now there are stairs.” Silly Kari. Picking our way to the top. Look at that smile. He’s having the best day ever. The three of us are stubborn. James delightfully (for me) goes along with my terrible ideas. Zozo is part goat, scampering and hopping along like a fearless puppy (he’s 9). The rain wouldn’t stop us. And the final view… totally, absolutely worth the stress. Covered in mud and more damp than dry, we made our way back down the mountain. Someone fell on their tush (hint, it wasn’t me). We piled back in and made the drive to Charlottesville. More on that later. 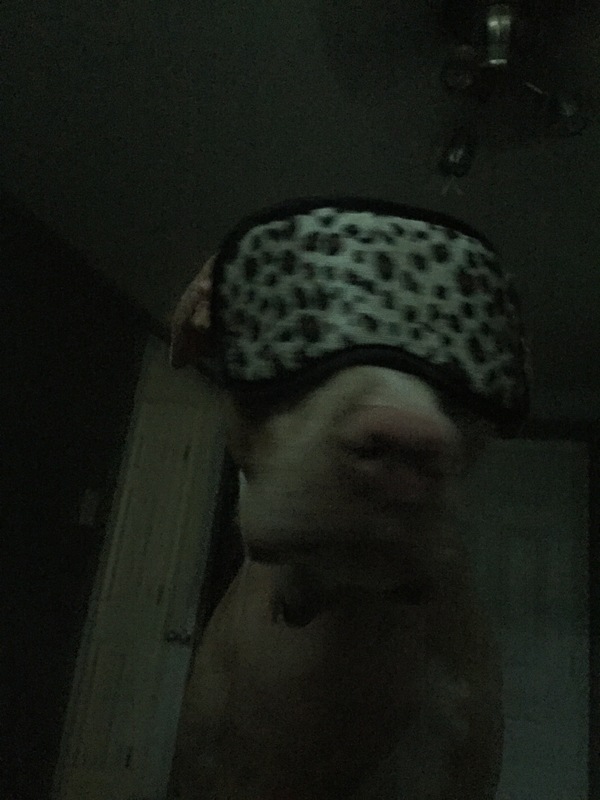 Why yes, this is a leopard hound (mix) in a leopard-print sleep mask. “Hiding” and “quiet” are not two things we do well. Idea courtesy of The Daily Prompt. Diamond, the Staffy-mix with the derpy tongue on the right, has found her forever home. Three weeks ago, Diamond’s forever family fell in love with her toothy grin and goofy nature and brought her home. AND SHE LIVED HAPPILY EVER AFTER. Bud the lab-mix (on the left) is more… particular about his humans. Here’s what that means: he needs a seasoned/experience dog owner. He likes some humans more than others. Just like you (human, reading this post) don’t like everyone, dogs are also occasionally picky about their human companions. That’s ok! Alley Cat Rescue partnered with the ASPCA of Anne Arundel County, and Bud and his waived adoption fee have been transferred to them. He’s working with a trainer every day while he waits for his best-match family. You can read his profile here. We’re so excited these two are doing so well.